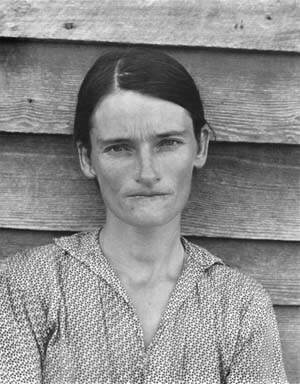 In 1936 Walker Evans photographed the Burroughs, a family of sharecroppers in Depression era Alabama. In 1979 in Sherrie Levine rephotographed Walker Evans' photographs from the exhibition catalog "First and Last." In 2001 Michael Mandiberg scanned these same photographs, and created AfterWalkerEvans.com and AfterSherrieLevine.com to facilitate their dissemination as a comment on how we come to know information in this burgeoning digital age. Here on AfterWalkerEvans.com you will find a browsable selection of these images. Links to the high-resolution exhibition-quality images to download and print out. Along with a certificate of authenticity for each image, which you print out and sign yourself, as well as directions on how to frame the image so that it will fulfill the requirements of the certificate. By building the image's URL into the title - the image to the left is "Untitled (AfterWalkerEvans.com/2.jpg)" - the images are locatable and downloadable by anyone who sees or reads about the image. By distributing the images online with certificates of authenticity, the images are accessible by anyone. Unlike the work of the late Felix Gonzalez-Torres ‹ known for his spills of candy and stacks of paper from which the viewer can take a piece of, though the sculpture stays complete because the owner possesses the certificate of authenticity, the right to reproduce ‹ the certificates here are used to insure that each satellite image be considered with equal authenticity, not the opposite. This is an explicit strategy to create a physical object with cultural value, but little or no economic value.